So, on the last warm-up before Euro 2016, Ireland’s second-string didn’t exactly offer much encouragement for the key first match in Paris. Representatives of Sweden - as well as Belgium, France and Austria but not Italy - were at Turner’s Cross to watch a mostly poor Irish 2-1 defeat to Belarus, and will have gleaned little other than the fact the back-up options didn’t really put their backs into it. The defeat obviously has to be put into the context of most of the players already knowing they would be in Martin O’Neill’s final squad - with official confirmation oddly being kept until after the final whistle - and wanting to stay fit. There was still a general lack of sharpness. Ireland only started to show pride and a proper response to the goals by Mikhail Gordeichuk and Maksim Valadzko once Stephen Ward made it 2-1 and O’Neill made a raft of changes, bringing in the certified first-team players like Shane Long and Wes Hoolahan. Seventy-fifth-minute substitute Callum O’Dowda did look like he felt he could still claim a place, offering impetus and impressive touches when he came on. From the rest of this game, though, you certainly wouldn’t have guessed that these Irish players were going to Euro 2016 or that Belarus got nowhere near qualification. The eastern Europeans in fact lost 3-0 to Northern Ireland last week, but often threatened to subject O’Neill’s side to a similar humiliation here. There was barely any threat, meanwhile, of Ireland putting a proper passing move together. It was the central midfield that looked most off the pace in this game. All of Jeff Hendrick, Darron Gibson and David Meyler gave the ball away on more than one occasion, with Meyler getting dispossessed for Gordeichuk's supreme 19th-minute opening goal. All of that only emphasised what a loss the more technical Harry Arter could be, as a pre-game injury endangers his Euro 2016. Of course, injury was what most players would have primarily wanted to avoid here, explaining some of the display. That didn’t seem to bother James McClean, though, who thundered into Dzianis Paliakov on 13 minutes to start a running battle with the full-back. The West Brom winger then got himself into an altercation in the second half. Ireland could still have done with a bit more aggression in general and, when Murphy finally got clear on 29, he seemed to have no sharpness whatsoever. The striker club-footed a touch, allowing Belarus to easily clear. Murphy showed similarly jaded reactions just seconds into the second half, when Aiden McGeady’s deflected cross set up for an easy header in front of goal, only for his effort to float harmlessly over. Harmless summed it up, for a striker that doesn’t strike. Murphy ended the game without scoring his first international goal. For his own part, the cross was one of the most productive things that McGeady has done in an Irish shirt since his two goals against Georgia, that effectively sealed his place in this squad. His display still wasn’t as dynamic as O’Dowda’s. Ciaran Clark was actually showing Murphy how to do it, twice going close with strong headers early on in the second half. The second, from a McGeady corner this time, forced a brilliant save from Syarhey Chernik, before Hendrick drove into the side-netting. The goal conceded aside, Ireland’s centre-halves were among the better performers, with Richard Keogh showing solid leadership. Just when Ireland were finally starting to build, though, the flank of that defence was exposed. Valadzko cut inside from the left and fired into the far corner, thanks to a deflection off McGeady. 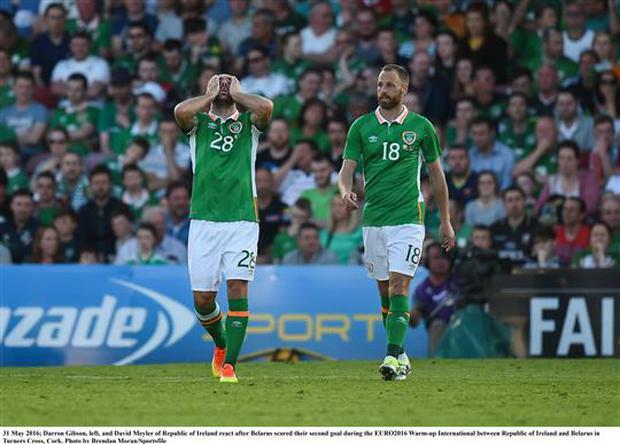 Ireland eventually responded through Stephen Ward, who smashed in a fine strike on 71 minutes. There was no final flurry. The nature of this match means there isn’t all that much to worry about - so long as the team is much changed for Euro 2016, in more ways than one. Alexander Britton, in Paris Football fans from across Ireland have been honoured for their sportsmanship during Euro 2016 by the mayor of Paris. Northern Ireland’s fans made a big impression on the French at Euro 2016 — and now Paris is going to say “merci”.